On Wednesday, April 22, IIMA and VIDES attended the “Women of Power” book launch and panel, which featured Torild Skard (Norwegian politician and author), Elayne Whyte Gomez (Ambassador of Costa Rica), Nyaradzayi Gumbonzvanda (world leader of Young Women Christian Association), and Sigrun Habermann (moderator). 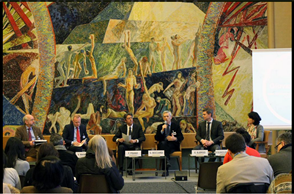 It was held in the UNOG library, directly in front of “The Dream of Peace” fresco by Norwegian painter Henrik Sørensen. First, Ms Skard spoke about the artist Sørensen, since he was a family friend. Then, she turned to her book, Women of Power, spanning the political contributions of women heads of State, during 1940-2010. It deals with not only whether, but what difference they were and are able to make, covering the careers of 73 women in 53 States. She spoke extensively about which paths those women have taken to reach the top: most commonly, as insiders that climbed the political ladder and broke down barriers within political parties themselves. Next to take the floor, Ms Whyte Gomez spoke about the influence her family had on her own political career, stressing the importance of self perception starting with the family first. She finished with a warning that progress is not irreversible, and continual pressure is necessary to continue to move forward. Ms Gumbonzvanda spoke third, and talked about the weight of context. She mentioned the need for a pipeline of leadership, starting with girl leaders on the playground. How can women in power now prepare girls to be leaders in the future? Following these words, they each gave their own views on how women can be more present within political parties, and what specifically were the personal and professional factors that helped them to achieve the status they currently enjoy.